How Do Disposable Addresses Work? There are several ways to create disposable email addresss on your own; some are a lot more work than others. My favorite is “plus addressing” with Gmail, which lets me make up a disposable email address on the spot for whoever wants it. Here is how plus addressing works, and some limitations on this technique. Trashmail receives emails and forwards them to your permanent address. 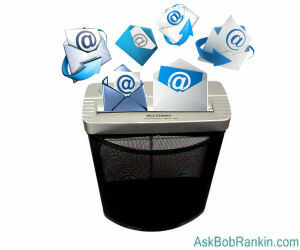 When you set up a disposable email address on Trashmail, you can set a limit on the number of emails that can be received or the number of days that may pass before the disposable email address expires. Your disposable email address can be a username of your choosing on trashmail.com, or 10 other domain names (trashmail.me, trashmail.at, trash-mail.at, rcpt.at, kurzepost.de, wegwerfmail.de, wegwerfmail.net, wegwerfmail.org, objectmail.com, proxymail.eu). An optional Chrome browser addon makes it more convenient to use the service. Basic service is free, but if you want more than 300 addresses, unlimited forwarding or a permanent address, Trashmail Plus can be purchased for US$12.99/year. Mailinator: There's no registration, just make up a username and give out the address username@mailinator.com. That address will be created on Mailinator’s server when someone sends mail to it. Just be aware that Mailinator inboxes are public, so anyone can read mail sent to that address (but only if they know the username). After a few hours, all mail is deleted. So Mailinator is an easy, on-the-fly disposable email address service useful for online forums and other sites that require one-time registration. You just go to Mailinator.com to respond to the “confirmation” email sent by the forum or site. At GuerrillaMail, you can choose a username and one of ten domain names for your temporary email address. (My favorite is sharklasers.com) Like Mailinator, messages are public, and are held for one hour before they are deleted. One nice feature is that you can scramble your email address, to make it harder to guess. GuerrillaMail also lets you reply to incoming messages. 10minutemail: Load up this site, and you immediately get a random email address that vanishes after 10 minutes. You can get a 10-minute extension if you need it. Just refresh the page to see any incoming messages for your temporary address. View, delete or reply to any new messages that appear. And if you want to explore further, here's a list of over 40 temporary and disposable email services. Most recent comments on "Fight Spam With a Disposable Email Address"
I have my own domain and have it set up so that any emails sent to it that have no account attached to it, are sent to me. I have been using an email forwarding service (Sneakemail.com) for over 12 years. EVERY person, company or service that I correspond with (no exceptions) gets their own unique address. Nobody gets my real address - nobody, not even my wife or adult kids. It has proved to be enormously beneficial. I get zero spam. If spam ever shows up even once, I know from the header of the offending email who the culprit is that shared the email address they were given. I write to them, chiding the offending correspondent, reminding them of the need to never put the address that I have given them, in the clear anywhere (such as the cc field). I delete the offending address and issue them a new one at that time. Even Bob Rankin does not get my "real" email address even though I know he is trustworthy. Rankin's address for me was last created in October 2011 and that address has never been the cause of any spam or malware. No matter, because every single person who writes to me has a private channel that they communicate through and there is never a question of who is causing trouble and who is not. This advice from Rankin should be implemented by you immediately and then never deviate from the policy. It just works. Wow, I had no idea. Thank you for the advise. like the virus that stole my hubby's computer keystrokes, read his email, lifted his identity data including security answers, and attempted to empty his retirement fund--stopped only by the company recognizing that the hacker was not using hubby's home IP address. for your quick and easy delete/replace if Yahoo's good spam filter, sender's Unsubscribe, Yahoo's customizable Block, and changing your email account password (if spammer used your alias email address to mail to others) not enough. When I was about 20 years old (50+ years ago) There was a TV show that was about "investing"It offered subscriptions to "Changing Times" magazine. According to wikipedia, it was one of vthe first infomercials. I subscribed to it & evidently they misread my first name because the subscription came in a name that was definitely a male name. Shortly after that I started getting junk mail to that name. One I distinctly remember was for cocktail glasses that had pictures of women on them who had less & less clothes on as you emptied the glass. From then on whenever I filled out anything, I gave a different middle initial so I could trace who sold my info. I find Yahoo disposable addresses really simple to set up and use, plus there is absolutely no part of the name on the disposable address that refers to your main account unless you chose a similar name, so it cannot be linked the way you say the g mail version can by a human. Initially you choose a base name, it can be anything that is not being used already, mine is in no way similar to my real address. When you need a new disposable it is very easy to add the part of the address that is unique to the base name, eg. basename-bobrankin@yahoo .com, and you are done. The mail to that address comes to your inbox and when you respond you can use the disposable address as the sender address, not your real address. I cannot think of any way at all that the disposable address can be linked to the real address unless you chose a base name that gives clues. Yahoo allow 500 disposable addresses so it would be hard for most folk to use that many up, if you do, just delete one you no longer use. I found them very useful when certain companies were hacked and email addresses were compromised. I just set up a new disposable address. Thank you, Bob! Your useful advice keeps me reading your posts. I'll implement today's tip immediately for filling out forms. One question: What about filling out governmental forms, like from the IRS on my tax form? Would you do a +IRS@gmail.com address then? I used the gmail plus sign technique a while ago and then had problems where could not unsubscribe that address on some sites because the email address had a special character in it. You would think that is the signing up form allowed a special character then the unsubscribe form would allow the same. Thanks for this tip Bob. I have used the "abc+bob@gmail.com" for a little while now. However, there are some websites that will NOT allow you to put the " + " in the email address. Andy: Sort of. I've never tried a "+", but I have had websites reject a dash, but accept an underscore.